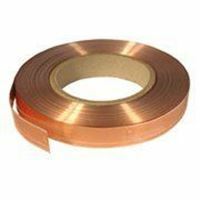 The standard flat foil cable supplied by Ampetronic is 18 mm (0.71”) wide, with a copper section of 1.8 mm². The cable is supplied in 50 meter (164 ft) reels. The construction of the cable is copper foil of 0.1 mm thickness, covered in bonded Polyester film. Total thickness is 0.25 mm (0.01”). In order to facilitate the installation, no adhesive tape is fixed. To turn corner, the tape is folded over. To terminate, tin the end of the tape with a good soldering iron, melting the plastic coat with the solder. Solder on a wire (or the next length of tape) to the copper tape, and insulate with electrical tape.